On Sunday 10th May, 6 lucky cadets from 84 (Coventry Airport) Squadron went to RAF Cosford for the first flying slots in almost two years. Each flight lasted approximately 25 minutes taking them high above the countryside to see the world from a different perspective. The 6 cadets aged from 14-17 were selected to attend the Air Experience Flying Day at RAF Cosford following a long period of aircraft maintenance, pilot training and bad weather which hampered previous allocations over the last twelve months. On arrival at the flying station early on Sunday morning the cadets were given a briefing on the weather conditions, flying controls and the aircraft before being kitted up in a flying suit, gloves and helmet. The safety video showed the cockpit layout of the GrobTutor along with the safety aspects of accessing the aircraft and the procedure for emergencies. Finally, issued with a sick bag each, they awaited their flights! Throughout the day each cadet went with an instructor who took them out to the aircraft and up in the air. The volunteer pilots have a great wealth of knowledge and experience either in the services or in commercial aviation industries and really enjoy taking young adults on flights to train and share the power of aviation. One commented to Cadet Daniel Stephens mid flight that “it’s just what we do!” Whilst the pilots do the majority of the flying on the first sortie, especially take-offs and landings, once up in the air, control is handed over to the cadets to experience flying the aircraft for themselves. They are taught how the controls work, how sensitive they can be and how to fly the aircraft straight and level. Usually, if the cadet has managed the controls successfully and the weather conditions are right, there is time for a spot of aerobatics under the control of the instructor. Sick bags at the ready they performed loops, rolls and other exciting manoeuvres before coming back in to land. 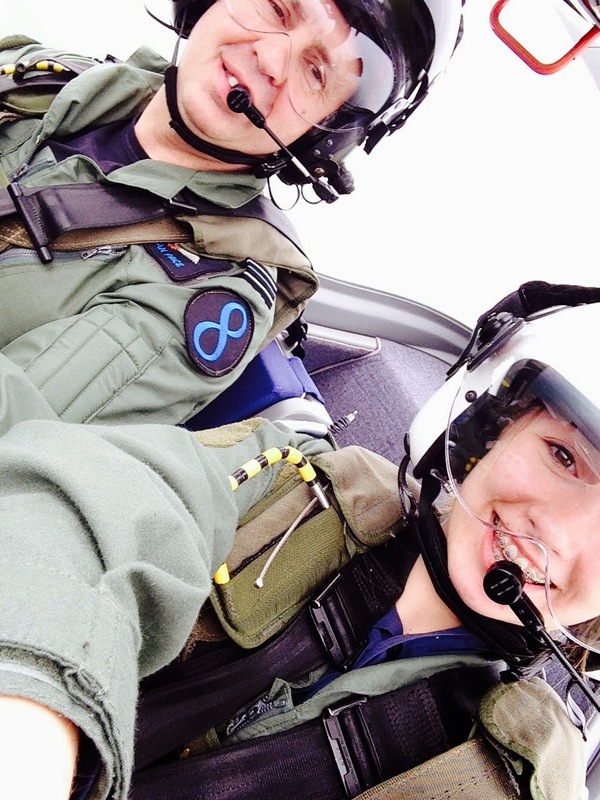 Cadet Eve Hibberd who only joined the Squadron in September 2014 said that she “really enjoyed the whole experience. Learning about flying controls in the air was really cool and we had so much fun. I appreciate the unique opportunity we have as Air Cadets and I will remember this forever”.